Welcome to the 360WaveProcess learning page. You will discover countless tips and valuable information that will guide you on your process to getting waves. If you’re a beginner or half way into your process of getting waves, please be sure to sign up in the email list to stay up to date with the latest in 360 waves. Read through the website to learn how to get waves on the Top, Sides, and Back. “Getting 360 waves is not as difficult as many people believe and Getting 360 waves is not as easy as some people may make it seem”. The Motivation to stay committed to the process. Get 360 waves ! The Information necessary to proceed smoothly through your waving journey with minimal flaws. The support you need for those days when you feel like you’re making no progress. The group environment that is essential in keeping the process fun and enjoyable you. And so many more valuable and beneficial things that will help you throughout your process. Okay I hope you are ready! I really feel that 360 waves is the best hair style for men. Even for young children too! I say this not simply because the hair style looks nice, clean, and professional. I say this for more than superficial reasons. 360 waves is the best hair style for men in general because it builds character. For the mass majority of guys who attempt to get waves, I’ll say at least 80% of them will find it difficult if not extremely difficult to get t them to come in fully. When I say this I’m talking about full three-sixty waves, not just the simple plain waves at the top. There is a difference between having three-sixty waves and having only waves at the top of the head, Major difference. 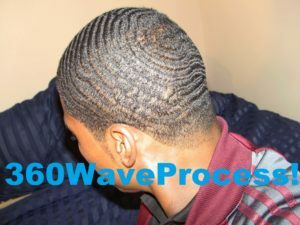 That being said the purpose of 360WaveProcess is more than just getting you waves. It’s here to help you build as a person too! How is it going to do that, you may be thinking. The 360WaveProcess will do that because it’s centered around one important thing. 360 waves is not just a hair-style, it’s a life-style! Waving is more than just a hairstyle for men and women. Waving is a life-style and that is why I strongly feel that it is the best hair style for men! especially young men that are on their way to becoming adults. Let me tell you what this life style is about through via a story, some what poem like. Not an hour passes by without me feeling the urge. I wake up and get to it like there is nothing to it. I keep my brush within an arm’s length at all times. I put olive oil in my hair because I like the shine. If they put me in jail, give me a bush and I’ll be fine. Some people don’t understand why but its fine. I’ve spent over thirty-dollars on a brush not just once. I’ve learned that it takes time to get what I want. I want this so bad that I’m willing to spend that time. I keep a brush with me at all times and a few know why. I brush my hair all day, I do this every day & some people ask me why. Like I said, some people don’t understand why but its fine. I got really carried away there but the main idea is that the life-style of waving will engrave into your character some very valuable characteristics that are highly respected. These qualities are good for guys. It teaches dedication, persistence, and patience. It leads to confidence, self-respect, and good hygiene. This is why I feel that waving is the best. I’m a living proof of this. I am so happy that I found waving. I can honestly say it has changed my life for the better and sent me in a positive direction. Even before I began helping others get waves. My confidence and self-respect grew when I started waving. I hope you’re ready now! You may be really hyped up and motivated right now after reading that. I hope you are still brushing your hair as mentioned in the beginning. If you didn’t have a brush to brush with, then you are not ready for the journey. Here is some advice when it comes to waving. Your brush is your best friend forever. It goes where ever you go no matter what! Navigate around the site for more readings and Please make sure to sign up for email updates to stay connected with the wave family. Also if you really need to get waves and have no time to waste you can visit here! to check out the 360 Waves Mastery E-book. It is a comprehensive guide that will show you how to get your waves spinning in 3 weeks or less.